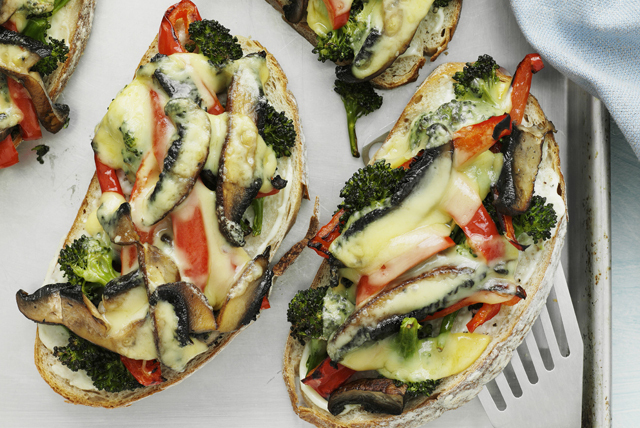 Ooey-gooey melted mozzarella cheese smothers grilled fresh red peppers, portobello mushrooms and broccoli in these delicious vegetarian sandwiches. Toss vegetables with dressing. Grill 3 to 4 min. on each side or until peppers are crisp-tender, adding bread to the barbecue for the last minute. (No need to turn bread.) Remove vegetables and bread from barbecue. Reduce heat to low. Slice vegetables. Spread toasted side of bread slices with cream cheese product; top with vegetables and mozzarella. Grill 2 min. or until bottoms of sandwiches are toasted and mozzarella is melted. Garnish with chopped fresh basil before serving. Prepare using your favourite combination of grilled fresh veggies.